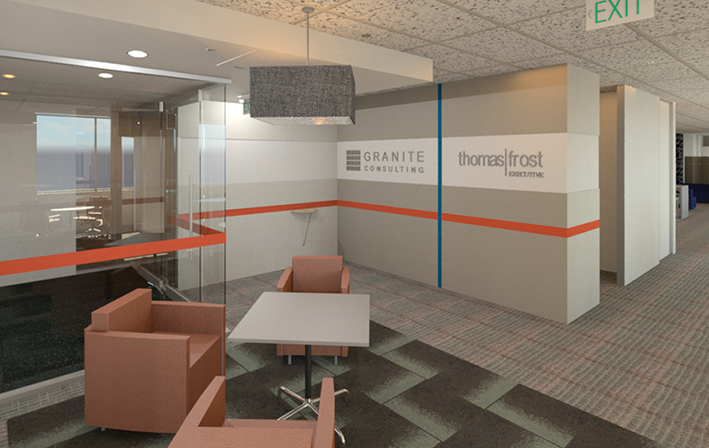 Granite Consulting & Thomas Frost recruitment agencies moved to a larger tenancy within the same building they already occupy. 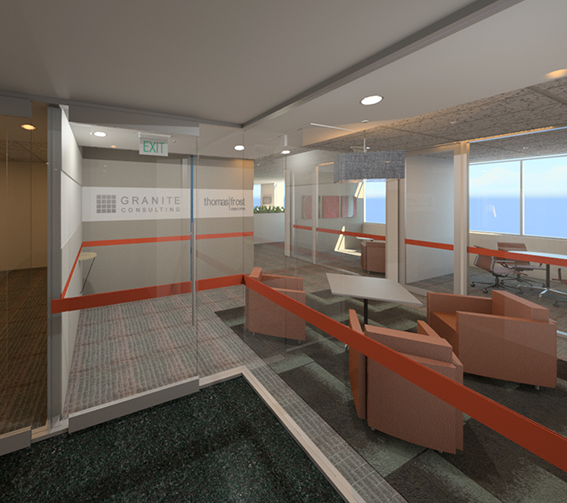 When the decision to move was made to relocate, the firm’s co-founders key commitments where to create an open, light and comfortable environment for staff. 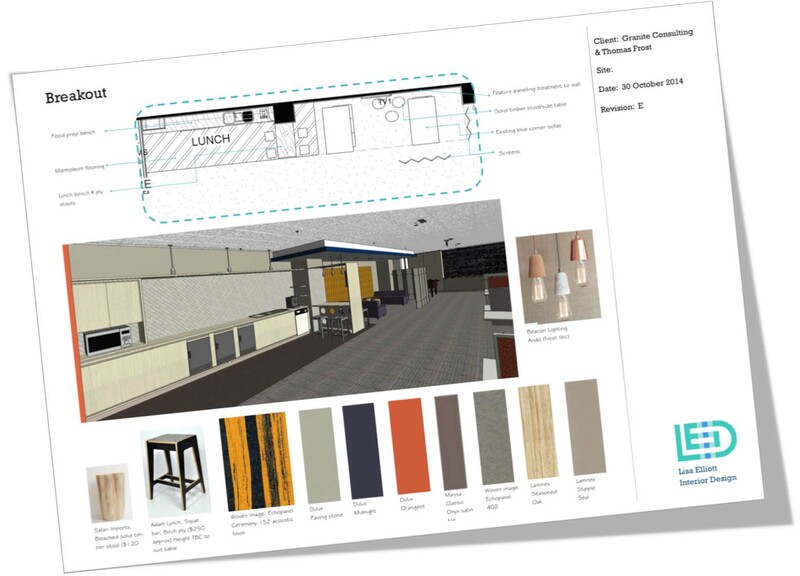 A modest budget for the front of house area set a challenge for the designer to transform the tiny entry into a bespoke waiting area with plenty of visual impact, that incorporated 2 very different company brands, utilising a neutral colour palette that the client was most comfortable with. 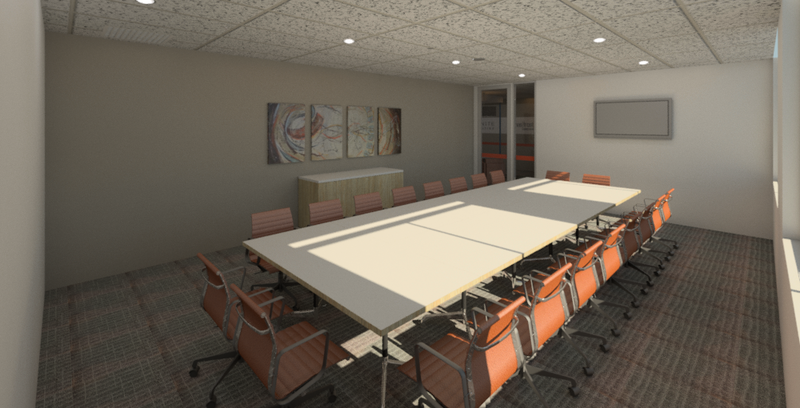 The firm has regular visitors and required interview rooms and a flexible boardroom & conference facility, providing presentations for visitors. 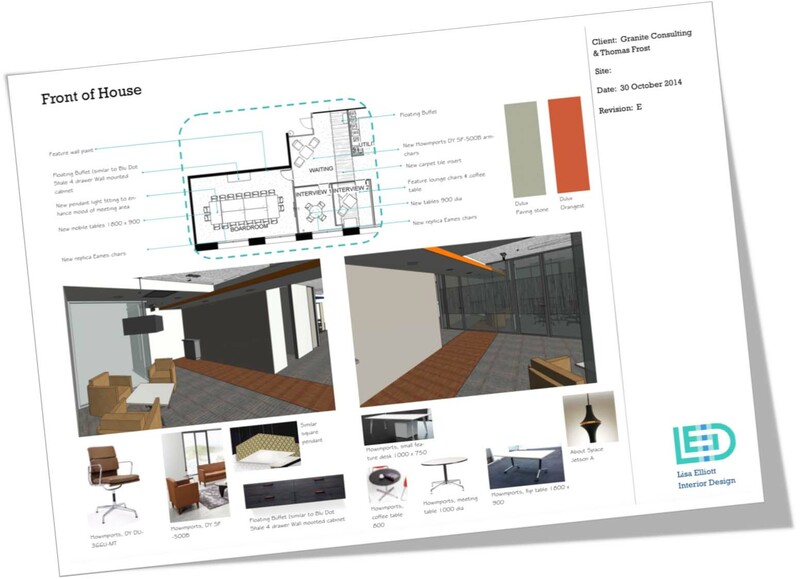 The use of Revit software allows me to build three dimensional views of the space and walk the client through the design during all stages of the process, allowing for a thorough understanding of the room layout, furniture placement, down to details of fittings and finishes as the design evolved. This allowed me as a designer to introduce new ideas such as graphic re-interpretation of each of the corporate logos to work side by side each other and integrate into the overall space, and thus allowing the client the confidence to accept (or discard) new ideas & interpretations of the design. Staff were moving from standard 120 degree snowflake style workstations to a smaller, more compact straight desking system, and the perceived loss of personal space. 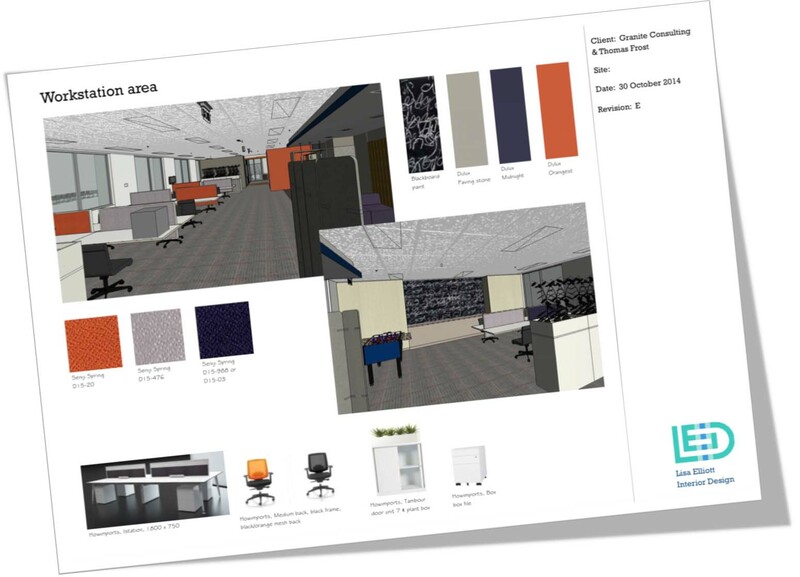 Therefore our first task was to address storage requirements & consider options for personal storage and creating an adaptable desking style that staff could modify themselves to suit their own style of work. 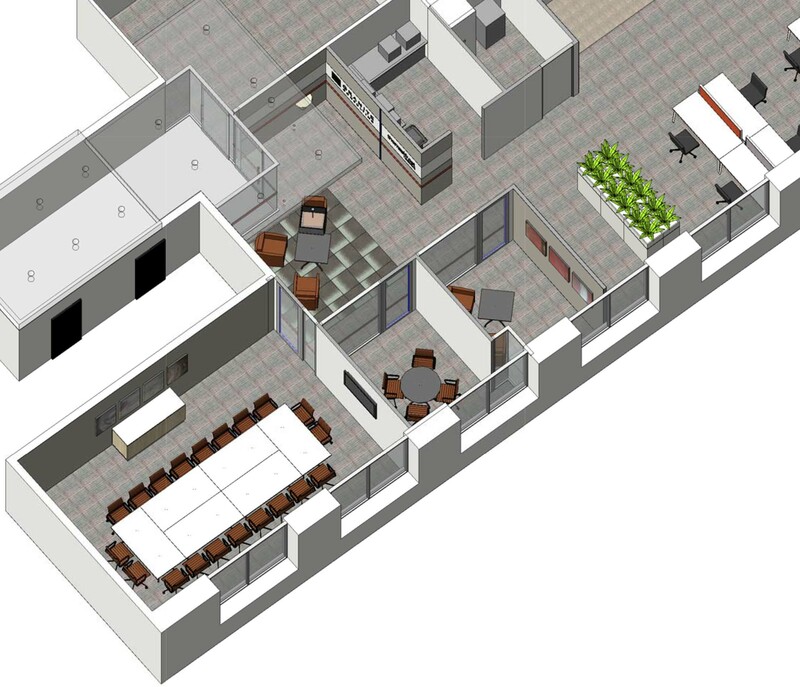 This system also gave the firm flexibility for expansion for future staff growth. Secondly, introducing elements into the workplace such as planters to divide work areas and provide a more intimate environment within an open area and divided each company into their own areas; blackboard paint on walls to create opportunity for informal & dynamic discussion points. An open breakout area is the focus of this space; the brief was for a home-like open area with a lunch table that doubles as a meeting point & drinks bar, lounge area, with Wii and playstation & foosball table. Acoustic panelling was added to this area to address anticipated noisiness. The finished result is an office that is open and light, with warm & welcoming textures and finishes, where all elements are carefully considered, to reinforce the firm’s brand, and provide an enjoyable environment for staff to work.